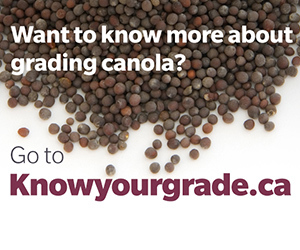 ALERT: Snow On Canola – What To Do? Snow on swathed canola will delay harvest, just like a rain would, but all a grower can do in this situation is wait it out. 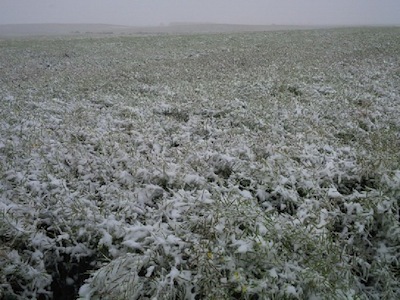 Note however that snow on swathed canola will take longer to shake off and dry out than snow on standing canola. 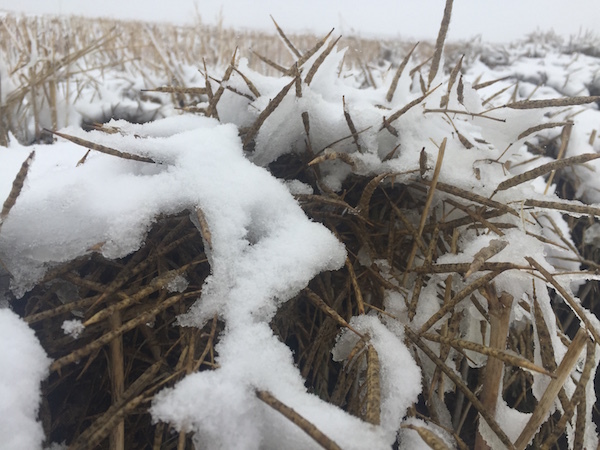 For growers with standing canola, harvest management concerns not so much the precipitation (although heavy snow can cause lodging) but the frost that comes with it. 1. Canola is immature when snow falls. 2. Canola is ready to swath when snow falls. 3. Canola left standing for straight combining is hit with snow. 1. Canola is immature when snow falls. If frost is light and the forecast shows a return to warmer seasonal temperatures, you may be better off leaving the crop standing so it can mature longer. 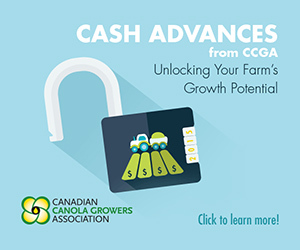 Cutting too early (before 30% seed colour change on the main stem and before all seeds on side branches are firm to roll) guarantees a yield loss. Canola can usually withstand a light frost, but keep an eye on it for a few days to make sure pods and pedicels remain sound. Frost (whether snowing or not) locks in green permanently but snow does not necessarily mean temperatures were low enough to create this permanent green. Rain can turn to snow at temperatures right around 0°C, and canola can usually tolerate temperatures of 0°C or -1°C without any ill effects. Also remember that moisture often reduces frost damage, and snow counts as moisture. Another factor is that canola swathed green takes a lot longer to cure than canola swathed at 50-60% seed colour change. Whether growers swath a green crop now or wait a week, combining will likely occur around the same time. And by cutting early, the crop may not meet its yield and quality potential. If growers want to take some action, perhaps make a couple rounds on a few of the most mature fields to see how the crop swaths and to check that the back of the field is as green as the couple spots they’ve been checking. These couple rounds will also give a sample to compare against if they’re interested to see after the fact which tactic worked better. Click here for more tips on swath timing and frost. 2. Canola is ready to swath when snow falls. This crop is mature, so frost at this stage will not hurt yield. Heavier frost will however stop the green-clearing enzymes, and green may be locked in permanently. This, unfortunately, can’t be helped. Start swathing as soon as you can and don’t bother waiting for snow to stop (unless you’re going to get stuck or if it’s a blizzard.) Moisture from snow would be just like a light rain, which can keep mature pods from shattering while swathing. Note that moisture will get trapped in windrows, which may extend the time required to cure the crop for combining. Heavy snow may cause lodging, which will complicate the swathing job. In that case, some snow melt may be required before swathing starts. 3. Canola left standing for straight combining is hit with snow. Frost can actually help desiccate a fully mature canola crop and any weed patches present, prepping canola for straight combining. Frozen pods may show a greater tendency to shatter, so be prepared to straight combine on even shorter notice to limit shattering losses. 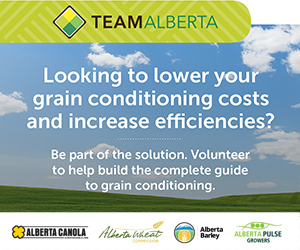 If frost hits before a standing crop is fully matured, swathing may give the crop time to cure and rescue more yield in the process. Check for major frost damage to pods before making this decision. 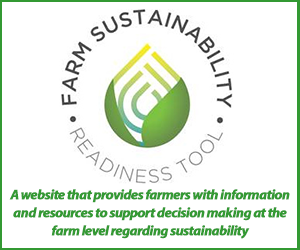 Assess each field individually. Some may benefit from the frost and remain good candidates for straight combining. Others may be better suited to swathing.